I recently received a fun commission from a good art friend of mine Eric Shonborn (http://www.shonborn.net/) based on a cross-over idea I'd had rattling around in my head for a while. 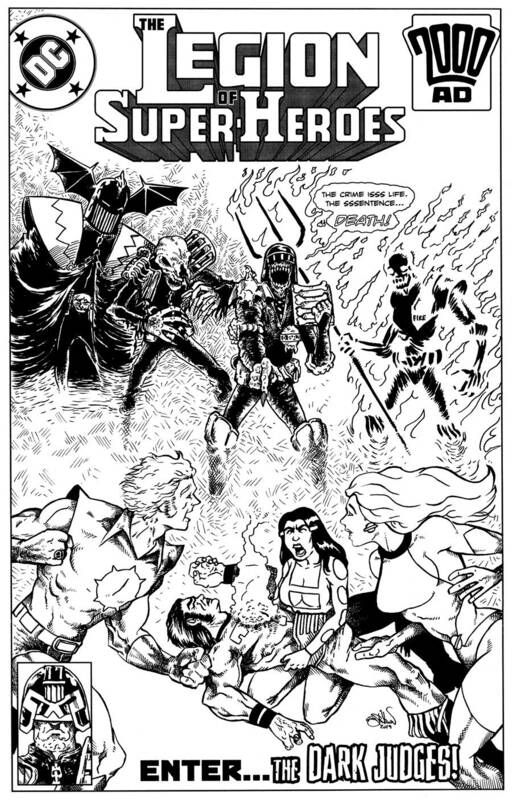 Four Dark Judges have just appeared in 30th Century Metropolis to cause mayhem and their first encounter with the local super-hero population has gone as well as can be expected. Just thought I'd share, because I think this is super cool. My friend Eric is currently open for commission work btw check out his site for details. That's not bad, hope Ultra Boy got his invulnerability up in time. Oh sure. Inertron is probably just as effective as Boing. The Legion does have a lot of advantages over the Dark Judges, numbers and an assortment of super powers. Inevitably, they will win. But IMO The Legion cares a lot more about civilian casualties then the Judges often do, and will likely throw themselves into the fight without fully understanding the Dark Judge's nature. Leading to a lot of early casualties thinning their numbers early on, including their heavy hitters (do you think Mortis can strip Mon-El of his anti-lead serum?). I've actually got the story some what plotted in my head. In the 4 on 4 fight this cover depicts Ultra Boy is taken out early to a Judge Death heart squeeze that leaves him comatose with just his invulnerability keeping him alive. Sun Boy gets a bad case of Judge Fear, taking his highly useful flames out of action. Saturn Girl gets a look inside Death's head and really really doesn't like what she sees. Phantom Girl manages to get them all out of there alive, but its a bad start. Things escalate from there with the Science Police, who sure ain't as hard as Judges, getting absolutely murdered by these guys (perhaps turned into a undead army on top of everything else?). Round 2's a little vague yet, but I'd have it center around Wildfire. Who, due to his anti-energy nature, isn't seen as 'alive' by the Dark Judges and they actually try to turn him over to their side. From there its just a game of attrition as the Legion struggles to figure out the Dark Judge's weakness (and get Wildstar out of their grip), and send them back where they came from. Crazy part is, a Legion/Dredd cross-over isn't that insane, IDW still has the Judge Dredd license I think, and they do crossovers with DC. The Star Trek/Legion crossover they did was actually really cool.